RAINFALL was recorded in the southwest quadrant of Western Australia, southern South Australia, most of Victoria and Tasmania, eastern New South Wales, and small areas in southeastern and central Queensland. At the start of the week, a strong cold front followed by a complex low pressure system tracked over southwestern parts of Western Australia, with the associated cloudband and embedded thunderstorms generating moderate falls in the South West Land Division and Goldfields District in Western Australia. The cold front and a weak low moved through South Australia, and continued to produced showers and thunderstorms, with moderate falls recorded in the Eyre and Yorke peninsulas, extending north into the Flinders District and southeastern parts of the State. By the middle of the week, the cold front and low pressure system tracked over Victoria and New South Wales. A cold pool of air behind the front generated thunderstorms through southern New South Wales and northern Victoria while a strong cold southwesterly flow in the wake of the front brought moderate falls to western Tasmania. Moderate falls were recorded in central southern and northeastern Victoria, and elevated areas of the Snowy Mountains and Southern Tablelands in New South Wales with widespread light falls across most of eastern and central New South Wales and much of Victoria, along with parts of the south coasts of South Australia and Western Australia. At the end of the week, a low pressure trough near the east coast combined with an onshore flow and produced showers and moderate falls over southeastern Queensland and eastern New South Wales. Isolated thunderstorms developed over the Central Highlands District in Queensland early on the 4th, and produced moderate falls. Rainfall totals exceeding 50 mm were recorded on the southwestern tip of Western Australian, and in an area of northeastern New South Wales. The highest weekly total was 104 mm at both Margaret River in Western Australia, and Ballina Airport in northeastern New South Wales. 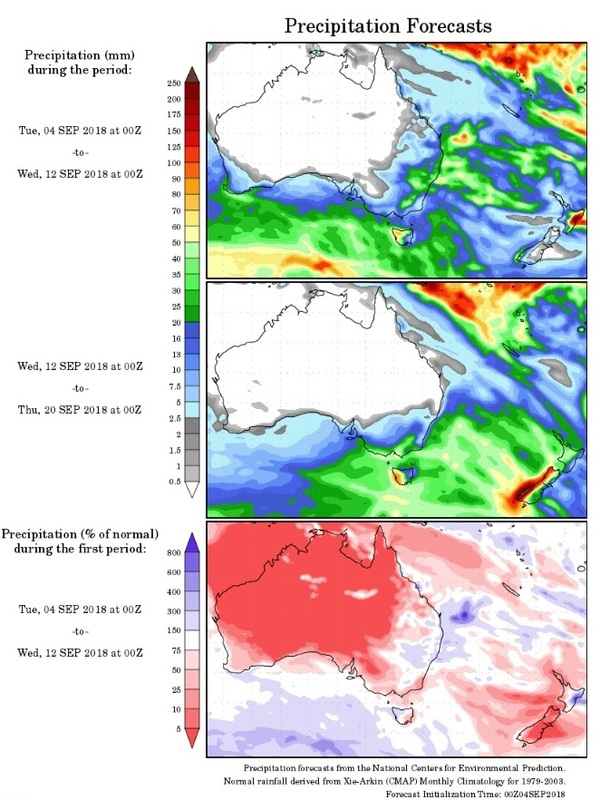 Rainfall totals between 10 mm and 50 mm were recorded in the South West Land Division and southern Western Australia; southern South Australia; southwest, central, northeastern and far eastern Victoria; western and northern Tasmania; eastern New South Wales; and small areas of southeastern and central Queensland. 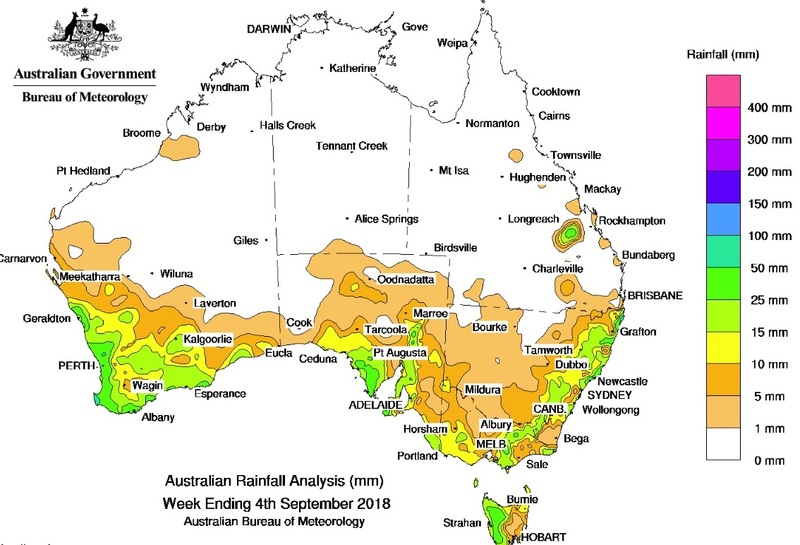 Little or no rainfall was observed in remaining parts of Western Australia, the Northern Territory, most of the northern half of South Australia, central northern Victoria, inland eastern Tasmania, central and western New South Wales, and most of Queensland.